11. What are the differences between a flip-flop and a latch? 12. What is the difference between Mealy and Moore FSM? 13. What are various types of state encoding techniques? Explain them. 14. Define Clock Skew , Negative Clock Skew, Positive Clock Skew. 15. Give the transistor level circuit of a CMOS NAND gate. 16. Design a 4-bit comparator circuit. 17. Design a Transmission Gate based XOR. Now, how do you convert it to XNOR (without inverting the output)? 19. Compare and contrast between 1's complement and 2's complement notation. The only advantage of 1's complement is that it can be calculated easily, just by changing 0's into 1's and 1's into 0's. The 2's complement is calculated in two ways, (i) add 1 to the 1's complement of the number, and (ii) leave all the leading 0s in the least significant positions and keep first 1 unchanged, and then change 0's into 1's and 1's into 0's. (ii) 1's complement has two arithmetic zeros, all 0's and all 1's. 20. Give the transistor level circuit of CMOS, nMOS, pMOS, and TTL inverter gate. 21. What are set up time and hold time constraints? 22. Give a circuit to divide frequency of clock cycle by two. 23. Design a divide-by-3 sequential circuit with 50% duty circle. 24. Explain different types of adder circuits. 25. Give two ways of converting a two input NAND gate to an inverter. 26. Draw a Transmission Gate-based D-Latch. 27. Design a FSM which detects the sequence 10101 from a serial line without overlapping. 28. Design a FSM which detects the sequence 10101 from a serial line with overlapping. 29. 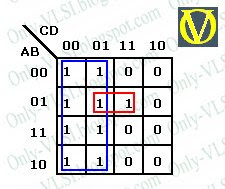 Give the design of 8x1 multiplexer using 2x1 multiplexers. 30. Design a counter which counts from 1 to 10 ( Resets to 1, after 10 ). 31. Design 2 input AND, OR, and EXOR gates using 2 input NAND gate. 32. Design a circuit which doubles the frequency of a given input clock signal. 33. Implement a D-latch using 2x1 multiplexer(s). 34. Give the excitation table of a JK flip-flop. 35. Give the Binary, Hexadecimal, BCD, and Excess-3 code for decimal 14. 36. What is race condition? 37. Give 1's and 2's complement of 19. 38. Design a 3:6 decoder. 39. If A*B=C and C*A=B then, what is the Boolean operator * ? 40. Design a 3 bit Gray Counter. 41. Expand the following: PLA, PAL, CPLD, FPGA. 42. Implement the functions: X = A'BC + ABC + A'B'C' and Y = ABC + AB'C using a PLA. 43. What are PLA and PAL? Give the differences between them. 46. What are the differences between CPLD and FPGA. 47. Compare and contrast FPGA and ASIC digital designing. 48. Give True or False. 49. Arrange the following in the increasing order of their complexity: FPGA,PLA,CPLD,PAL. 50. Give the FPGA digital design cycle. 51. What is DeMorgan's theorem? 52. F'(A, B, C, D) = C'D + ABC' + ABCD + D. Express F in Product of Sum form. 53. How many squares/cells will be present in the k-map of F(A, B, C)? 55. Simplify F(A, B, C) = S (0, 2, 4, 5, 6) into Product of Sums. 56. The simplified expression obtained by using k-map method is unique. True or False. Explain your answer. 57. Give the characteristic tables of RS, JK, D and T flip-flops. 58. Give excitation tables of RS, JK, D and T flip-flops. 60. Design a counter with the following binary sequence 0, 1, 9, 3, 2, 8, 4 and repeat. Use T flip-flops.